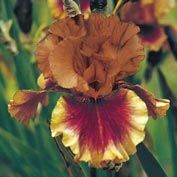 Apollodorus Classic German Iris | Gurney's Seed & Nursery Co.
A big, bold and unusually colored iris that's a standout in the garden. 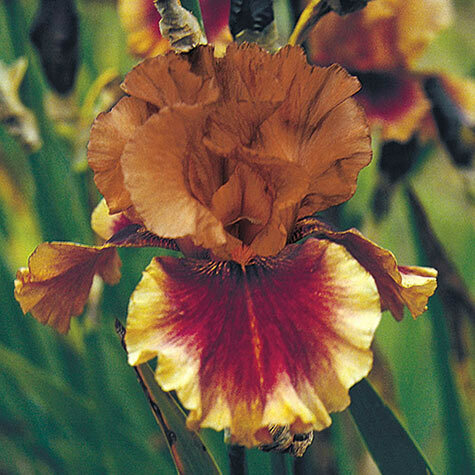 Its copper and maroon petals are highlighted with bright gold beards. Spacing: 18 - 24 inches. 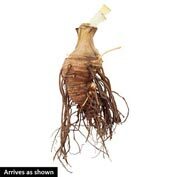 Depth: Set rhizome so bottom half is below ground level. Firm well and water thoroughly. Color: Copper and maroon petals are highlighted with bright gold beards. Foliage: Glaucous-green, sword-like fans of stiff upright leaves with some dying back in colder climates in winter. Blooms: Mid spring, re-blooms late summer to early fall. Flower Form: Typical iris flowers. 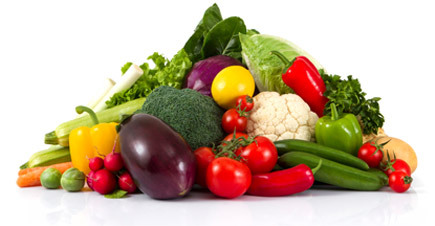 Soil Requirements: Prefers well-drained soil, but is tolerant of a wide range of soils. Pruning: Remove spent flower stems after blooming. In late fall, cut back foliage to 6" fans. Clean plant debris before winter to prevent borers overwintering. Comments: A big, bold and unusually colored iris that's a standout in the garden.